of Very Rev. Michael McConville D.D. Little was recorded by Dr. McConville regarding parish affairs during his brief pastorate. He died on 12th. December 1913 - only two years after his appointment. However, it was later discovered that he had paid for the erection of the tower out of his personal estate. He also is interred in Laurencetown Cemetery. On 6th. January 1914 Fr. Joseph Doyle, a native of Dromara, was appointed P.P. He had been Administrator in Newry prior to his arrival in Tullylish. Despite the difficulties of the First World War, and the sectarian strife in the local mills and bleach greens in the period 1918-1920 when many parishioners were turned out of their work, Fr. Doyle managed the affairs of the parish with determination and resolve. Accommodation for the clergy was minimal and visiting and relief priests had to use `lodgings' in the village. Consequently he extended the present house in Laurencetown in 1923 and purchased a house in The Square, Gilford on 14th. December 1926. Fr. M. Brown C.C. became the first resident curate in Gilford in the parochial house. Previous curates had used rooms at 19 Mill Street. 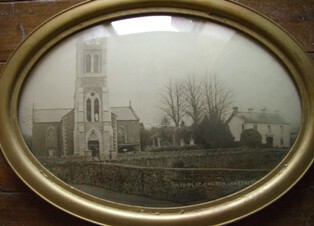 In February 1930, an ornate altar was purchased from Clonallon Parish and installed in Gilford Church. This replaced the altar, which had been in use since the opening of the church in 1849. In order to help defray the costs of an internal reconstruction Mr. John Gough, Gilford, donated the doors of the church and Mrs. Byrne and her sister Mrs. O'Sullivan donated the Stations of the Cross, which continue to adorn the walls of the church. In 1932, a new set of Stations of the Cross was purchased for Clare. Parishioners still recall the sadness and bewilderment felt in the parish when, on Sunday 8th. June 1935, the tolling bell informed the people that their beloved pastor had died rather suddenly. He had suffered a fatal fall in the Parochial House in Banbridge and is interred in Laurencetown cemetery. On 4th July 1935, Canon Carr was transferred from Annaclone to Tullylish as P.P. in succession to Canon Doyle. He was considered one of the most eminent priests in the diocese. Padraig Keenan recalls that he was beloved alike by the clergy and laity for his unaffected simplicity and unfailing good humour. On the 20th March 1936, he died, much to the sorrow and regret of those who had so little time to make his acquaintance. Like the majority of his predecessors, he was buried in Laurencetown. When Fr. Henry Doran, later to become Canon, arrived in Tullylish on 31st. March 1936, the parishioners must have felt legitimate pride in their achievements, in having three well-maintained churches and two parochial houses recently renovated to an acceptably high standard. Fr. Albert McGovern was appointed curate in Laurencetown in July 1946. He readily accepted the challenge to provide the necessary accommodation for a parish youth club. Fr. McGovern purchased two U.S. army Nissan huts for £ 180, had them erected by voluntary labour and so St. John Bosco Youth Club was opened in 1947. For 38 years it served the needs of two generations. On 6th November 1948 the tolling bell informed the parishioners that their beloved priest, Canon Doran, had died suddenly during the night. The sadness evoked by his unexpected death was keenly felt by his parishioners.